My daughter simply loves to do all that I do around her, more so, if it has colours or water associated. Who doesn't like to play with water? 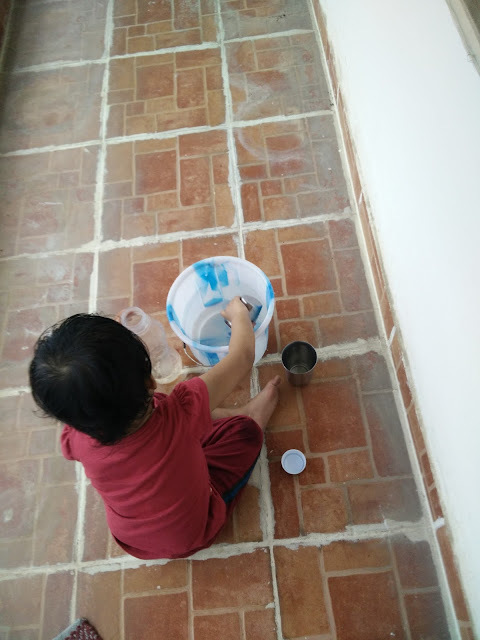 So, I decided, I could as well guide her in learning something and asked her to scoop out water from a bucket with glass and pour it inside the water bottle. I was amazed at the amount of concentration she carried all along the activity. Of course, some water spilled out, but, the amount that spilled out gradually lessened as she understood the mechanics of pouring water. Also, once the bottle was filled up, she emptied it back in bucket, during which, she tilted the bottle from the edge of bucket that is across her, the opening of bottle was facing her which made the water pour out on her for which she said 'Ayyooo, I am getting wet'. That is when I explained her how she was holding and the direction of water pouring out and asked her to empty the bottle by holding it by edge of bucket not across her, but, by the side of her and water poured out right inside the bucket. She played for quite some time. Unfortunately, I could not capture many good clarity pictures.